. Published on August 14, 2017. Does your outgoing voicemail greeting message turn off customers and prospects? Or does it compel them to engage with your company? It’s an important question to consider, and here’s why: Up to 82 percent of people calling businesses will hang up instead of dealing with a phone tree or voicemail, according to an often-cited virtual office study. Every hang-up is a lost opportunity for your business. Here are seven tips for engaging your customers and prospects with professional voicemail greetings. Keep professional voicemail greetings brief but useful. Convey whatever information or menu options you want to give callers as succinctly as possible. You might also consider telling callers at the end of your message how they can bypass it in the future. Remember: Your customers and prospects are busy people, too. Record customized greetings for different times of day. You might have one greeting to play during business hours and another one for after hours. Each could convey different information relevant to the time period. Give callers the option to get more information. Sometimes, callers simply want to know your operating hours, location, or other information. Giving callers a voicemail menu to get the information they need saves everyone time. Do you have lots of satisfied customers? Give them a voicemail option to record a brief testimonial about why they love your product or service. With their permission, you could use some of the best testimonials in your marketing or advertising, as The Men’s Wearhouse did several years ago. You might also provide a voicemail menu option enabling callers to hear your best testimonials. If nothing else, constructive feedback, whether positive and negative, can help you improve the customer experience. Tell callers about your current promotion. Are you offering a sale on your product or service? Tell callers about the promotion and how they can take advantage of it. Ask callers to leave detailed messages. To minimize calling back and forth, encourage callers to be as specific as possible about why they’re calling. Also ask them to tell you the best time(s) to receive a call back. 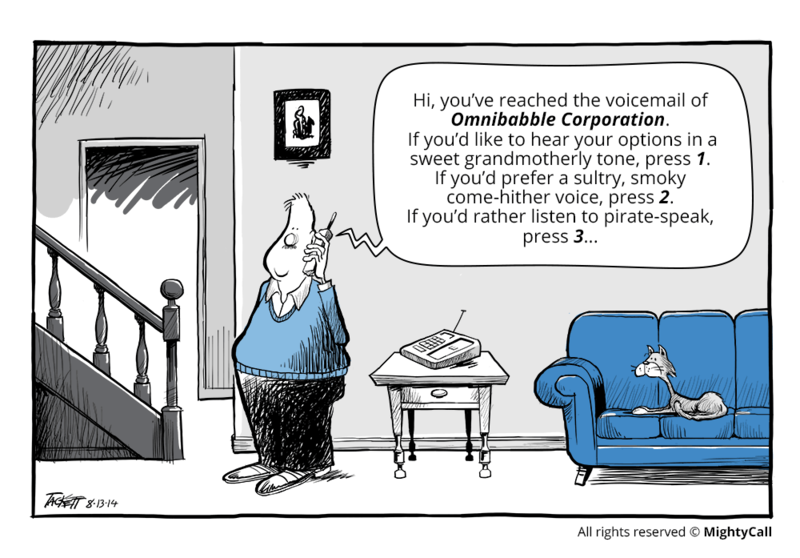 Always remember that your voicemail greeting may be a prospect’s first interaction with your company. If you’re unsure of your greeting, ask trusted friends, family or colleagues to listen and give you feedback. Finally, consider upgrading your phone system if necessary to give you more voicemail greeting options. MightyCall works with several partners that make it easy for you to record a variety of interesting, cool, funny, and engaging professional voicemail greetings and automate when they’re played. You can change the greetings as needed and easily create new ones for specific extensions, days, and time periods. Click for more information on voicemail greetings or check out MightyCall Voice Features.